For all the techincal details on the sculpt (absolutely no complaints) and the articulation (there's plenty of it, and it all moves perfectly), please visit our Scarabus review - this review is just about the differences on one specific variant. At last we come to our final Scarabus variant, Thothos. His colorscheme isn't as fully white as Winter Fun Scarabus' was, but we'd still call him the brightest of the variants. His clothes are white (or at least a pale blue-gray), but his armor is gold, orange and grey. That, coupled with the ruddy brown used for the gloves and leg wraps overall gives him a feeling of dawn, of daybreak. It's warm and inviting, especially after reviewing Haures. His fur and face are a medium blue, and the horns and hooves are darker. His Timekeeper armor is metallic green, matching the accent colors of his gems and staff. Thothos is of course based on the Egyptian god Thoth, and the odds are you just read his name wrong. Egyptians didn't have a "th" sound, so all the letters in Thoth are pronounced: it ends up sounding like "Dihauty" or "Tih-HOAT." He was the god of balance and mediation (like Metron or Zodac, he made sure that neither good nor evil ever triumphed completely), invented writing, science and math, and was depicted with the head of an ibis. 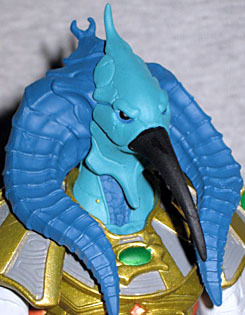 The figure's bird face is packaged off to the side, and you can swap it with Scarabus' easily. The face is a lighter blue than before, and it has a long, curved, black bill. Thothos isn't my favorite of the Scarabus variants, but he's certainly near the top. And heck, if you have any of Stargate toys he (along with Anubos and Horos) would make excellent alien stand-ins for them to fight.